Canary Wharf is one of London’s busiest business districts but when the working day is done and you want to wind down before making the journey home, a relaxing drink is probably the order of the day. But do you want to be part of the hustle, bustle and noise of some of the local bars or would you prefer a quieter time in less charged surroundings? Have a look at these bars in Canary Wharf and see which suits you best. Boisdale is the perfect place for an after work drink or an early evening cocktail. 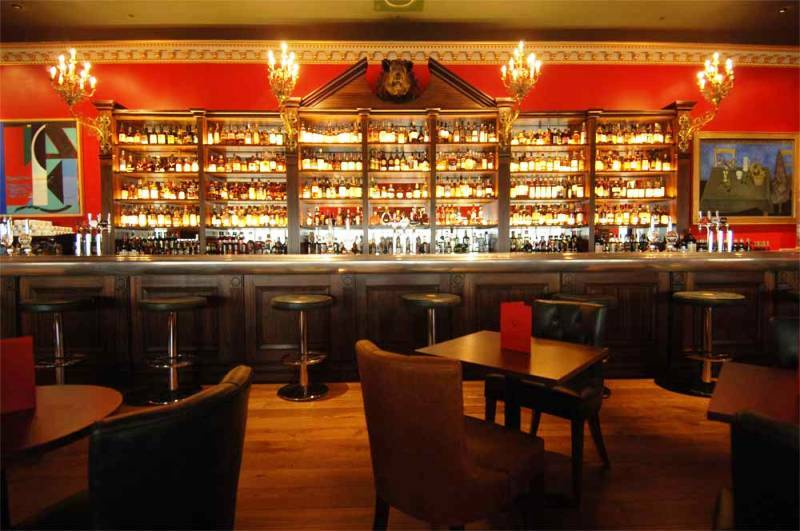 Boisdale’s cocktail bar has a warm, inviting ambience that makes winding down easy. Just relax with your drink – Boisdale’s cocktails are among the best in London – and forget the toils of the day, as you take in the soothing sounds of the jazz piano. If whiskey is your choice, then you’ll find a huge selection to choose from and, if you think that you deserve a little extra, you can indulge yourself on the terrace with a fine cigar from Boisdale’s extensive collection. Enjoy the evening in comfort and with excellent service – you’ve earned it. Located on Fisherman’s Walk, the Cat and Canary is a traditional pub that is now part of the Fuller’s chain. As you would expect from a Fuller’s pub, it serves a good range of ales and great food. It gets very busy in the early evening as people finish work so you can expect some noise and jostling. Its clientele is predominantly male but it has a good atmosphere and they even put heaters outside for smokers on cold evenings. Of all the bars in Canary Wharf, Astons is just a little far away from Canary Wharf tube station – the closest public transport being South Quay DLR – to make it convenient for office workers to drop in on their way home, but it enjoys a prime dockside location and offers a good selection of champagne, beers and cocktails. It’s a great place to wind down after work as patrons enjoy the elegant art deco interior and still have space to breath. It attracts the younger office set that often stay on for the evening – especially on Fridays when the excellent DJ gets the place jumping to an eclectic mix of music from across the years. The All Bar One is a trendy city bar that is very popular with those who like a drink after work. It serves good food as well as a good selection of drinks but when the office crowd gets in you can expect a lot of noise and sometimes a decent queue at the bar. But, if you don’t mind the wait, the All Bar One has a good atmosphere and attentive staff. The Parlour’s convenient location makes it anther of the bars in Canary Wharf that is a favourite for office drinks and after work get-togethers. This bar, kitchen and cocktail lounge has a good range of drinks and serves decent food but it does get crowded, especially towards the end of the week, so be prepared to spend a lot of time rubbing shoulders with strangers.